I think the biggest similarity is the determination you need to stay focused and confident that your story, or your routine, will be focused. 2. What is the biggest message you would like to impart with this book? they want if they feel passion for it, have support and stay the course! 3. What is a typical writing day like for you? process. The story idea was clear to me from the start but the actual words and images were a longer process. As much as I planned ahead, I felt that my actual output was driven by my kickstarter campaign. Since I first self-published it via crowdfunding, that deadline is what made me want to finish it and make it great! I highly recommend a campaign to get things moving. To be successful you have to create what you want, how you want and on the timeline you need. I love to read Oliver Jeffers books, anything by Peter Reynolds and books illustrated by Debbie Ridpath Ohi ("I'm Bored" and "Naked"). 5. What will your next book about? I am thinking about a sequel to Kika the Upside-Down Girl - Kika is older and has new adventures and challenges now that she has found what she loves - gymnastics. Her development includes learning from coaches, parental pressure, feeling different than other kids, balancing sport school and home life - that kind of thing, I am thinking though the kinds of things Kika would be exploring as a 12 year old - a whole new world! Kika the Upside-Down Girl is an especially cute picture book for young children. 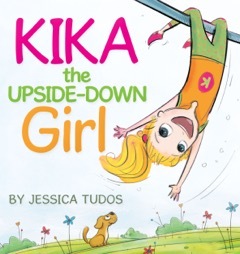 Children will love to "meet" Kika, a girl who has always enjoyed being upside down - even as a baby. Kika is happiest when being active and upside-down. This makes her different, but she is a cheerful child who accepts that difference is okay. However, she is even happier when she discovers the Gymnastics Emporium and meets other children who also love being upside down. This is a fun read for children with a great message. It would be a great read aloud at home or in a classroom. The writing is lively. It is a picture book with a likable character, lots of action, and and a fast, fun-filled pace. 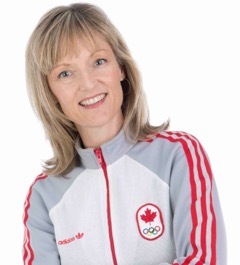 It is even more special because it is a book about gymnastics - written by an Olympic gymnast! The illustrations are bright and colorful. They really help to move the story along. I especially love the illustrations when Kika imagines upside down adventures in the jungle, in space, underwater, and on a mountain. This would be an especially fun book for a child who loves gymnastics. It would be a great addition to a home or school library. I recommend it highly! I'd love to win this for my young niece, who has as much energy as Kika seems to! I would love to win this book so I can read it with my nephew. I would love to read this book because it sounds like it would be a great book to read. My granddaughter loves dance and gymnastics. This book would be great for her. Thanks for sharing on Literacy Musing Mondays! I'd like to win this for my niece. I think she'd enjoy it - and I like that she reads! Mary, thank you so much! I am a big fan of Literacy Musing Mondays! My grandkids will like this book! Sounds like a fun book for a young gymnast. Thanks for sharing at the Kid Lit Blog Hop!